“It’s all we ever knew,” agrees Bethany Devlin, a 27-year-old mother of three, who will likely find her own children faced with the same questions as they grow up. Because six years ago, in 2008, Lindsey, now a 30 year-old mother of two, had finished up her degree in business administration at North Central University in Minneapolis and was making plans to start her own business. Back home, her parents, Marty and Crystal Mulder, owners of the Roosevelt Inn and Suites, the hotel Lindsey and Bethany grew up in, were watching their town of Watford City change and grow a little bit more every day. Phones were ringing. Hotel rooms were filling. The town and the people in it were making plans. So Marty started making his own. He picked up the phone and called his daughter, Lindsey. He asked her if she wanted to come home to manage the family’s hotel. It wasn’t the first time that Lindsey had heard the idea, but it was the first time she seriously considered it. Because Marty had also been speaking with her sister Bethany, who was finishing up her degree in Entrepreneurial Management at the University of Minnesota and she was making plans to come home too. When Lindsey’s husband Nick was offered a job as a youth pastor at her hometown church, the couple made their move. “I wasn’t sure how it was going to work, mixing our personalities and working as a family, but I just had to trust my dad,” said Lindsey, who would have never dreamed of having a career opportunity in Watford City, having been raised there during a time of economic downturn. And so the sisters came home, together, each with new husbands and each with an education, ideas and a history of a childhood spent working the front desk, cleaning rooms and helping to run the family business in Watford City. 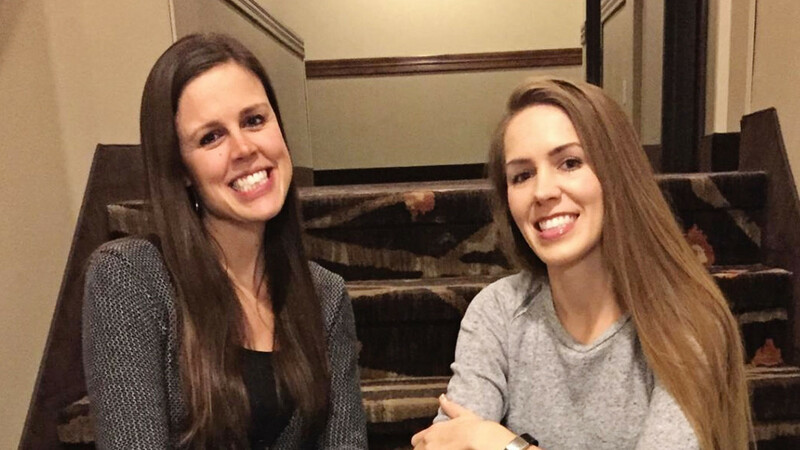 Lindsey and Bethany are sisters to three other siblings, Zach, Amy and Nick and through the years the Mulders have proved that a successful business comes with family support. Lindsey was only four years old when the Mulder family bought their first hotel, the McKenzie Inn in 1987, before Bethany was born. And she recalls standing next to her mom when the family made the decision to buy the old Super 8 hotel down the street, the hotel that would become the Roosevelt Inn, with its red shag carpet and much-needed repairs. “I remember mom wondering out-loud what they got themselves into,” laughs Lindsey who recalls the long hours the family put into the renovations. The family owned both hotels for a few years, before selling the McKenzie Inn and focusing their efforts on the Roosevelt Inn, one of only three small hotels in Watford City at the time. And as Watford City changed and evolved, the Mulder family pushed to expand their business and amenities, adding an indoor swimming pool in 2000 and an addition in 2013, their busiest months being the summer tourism and fall hunting seasons, where they would welcome regular and returning guests. Business continued as usual as the five children grew up and moved on to higher education and careers away from Watford City, but when Marty and Crystal welcomed their daughters’ families home, it was becoming clear that the town was changing, business was picking up, and that there was going to be enough work for the both General Managers, despite their apprehension. “There was a time between 2008 and 2010 that we were booking rooms up to six weeks, sometimes even two months ahead,” recalls Bethany of the sudden surge in population and work in her hometown. “We would turn away 50 or so rooms a day,” remembers Lindsey, who recalls the landmen and seismograph crews that filled their hotel in those years. To help fill the need for rooms quickly, the Roosevelt added 46 cabin units to the lot next to the hotel building, doubling the business’s room capacity. In 2012 the Roosevelt Inn cut the ribbon on a hotel addition that included over 100 rooms, a breakfast room, a workout facility, conference rooms, Jacuzzi and unique, private penthouse suites. After the dust settled on the construction, the hotel became a 24-hour facility with a staff that grew from five to 25 employees, with Lindsey and Bethany at the helm. While the sisters admit that getting into the grove of taking over the family business together was overwhelming and challenging at first, they have now settled into a routine and a set of roles that works for both sisters and their families. “It’s funny, we didn’t really sit down and talk about it, but we found out that I’m more like mom and Bethany is like dad,” explains Lindsey. So Bethany focuses on the numbers, handling the bookkeeping and the taxes. Lindsey is in charge of human resources, décor and making orders. They both fill in every gap in between, managing housekeeping staff and manning the front desk. Both Nick and Bethany’s husband Kody work at the hotel as well, Nick as groundskeeper and outdoor maintenance and Kody, a carpenter and Jack of all trades. With both families living in apartments inside the hotel, the families help take care of one another. Since Lindsey and Bethany took the reigns five years ago, Watford City has added five hotels with more development in the work. But the sisters aren’t concerned about the competition; both believing that it helps them strive to be their best. And while the Roosevelt Inn is seeing less seismographers and more construction crews and corporate employees, their long-running status in the community allows them to continue to serve their regular guests who return to town year after year for festivals, family reunions or hunting trips. Bethany says it’s fun to see how these regular guests respond to all of the changes in the community, and she admits that this growth has made her hometown a more exciting place to live. “There are more opportunities for my kids here than there were when I was growing up,” said Bethany. And while neither sister would have ever guessed they would be raising their young families back home in North Dakota, both agree that the leap of faith they took six years ago was the right leap for both of them. Soon their youngest sister Amy, who has been busy running one of the family’s hotels in Minnesota, will pack her bags and move back to Watford City. The entrepreneurial spirit in these women keeps their eyes open to more business prospects in their booming community.